Pomegranate Fruit Salad Recipe is bursting with Flavor and Color! Pomegranate fruit salad recipe may be the most beautiful fruit salad ever made! 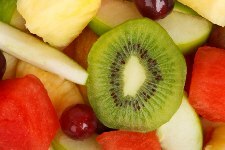 These fruit salads are bursting with so much color that your dining table will immediately be dressed up and ready to please. Pomegranate fruit salad is amazingly healthy for you too because it combines fresh fruit, sweet dressings, and tasty herbs together in a way that simply lights up your mouth with flavor. Really, this type of salad is fun to make because you can toss all of your favorite fresh fruits together in one bowl, add pomegranate seeds and a sweet or sour dressing, and you’re all set to impress! Some of the fruits we like together with our pomegranate seeds are bananas, pears, citrus, persimmons, apples and grapes (to name a few). Dressing ingredients that seem to compliment pomegranate salad recipes nicely are honey, mint, fresh lime juice, or simple syrup made from fruit. But, for some of these recipes, a dressing isn’t even necessary because the flavors and natural juices within the fruit make it taste heavenly already. 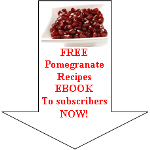 Read enough about fruit salad recipe and want to discover more pomegranate recipes?